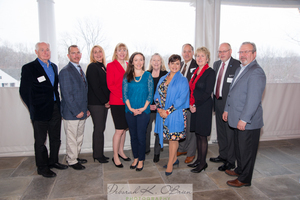 On Friday, March 15, The Ridgefield Chamber of Commerce hosted its Inaugural Breakfast and State of the Town Address. The community event, attended by local business leaders and government officials, recognized the Prospector Theater with the Compassion in Commerce Award. 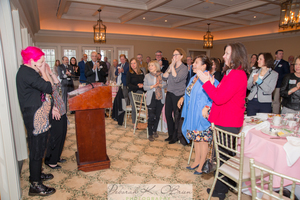 After Valerie Jensen, the founder of the Prospector Theater received her award, First Selectman Rudy Marconi began his State of the Town Address by focusing on the importance of compassion. "You nailed it, Val, you talked about compassion," said Marconi, who referred to author Chris Kukk, a professor at WCSU who wrote The Compassionate Achiever. Marconi said, "Compassion is getting down into the hole where that person is and getting the ladder and helping them to a better life. 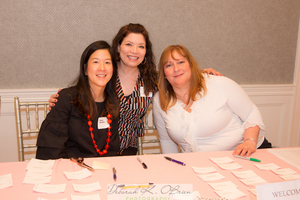 It's being a participant and that's what Val and the Prospector do day in and day out." Marconi spoke about the Town budget, federal tax incentive, and the local real estate market. "Real Estate is the barometer we use to see how well we are doing and what's going on," said Marconi, who called 2018 "a relatively good year". "We didn't see real estate come back to the extent we'd hoped, we have taken a hit in the upper end of the market but under $700,000 there's a lot of activity," he said. The Town of Ridgefield's federal tax package has been instrumental in saving the Town significant funds which will impact our local economy in 2020. "By August of last year, people who qualified [for the Town's incentivized retirement program] had to decide," five or six full-time positions." One of those positions Town engineer whose responsibilities have since been outsourced. Tom Gartrell, Sunburst Plumbing & Heating, Inc. 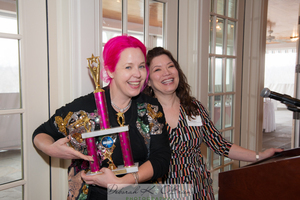 Thank you to the Ridgefield Chamber of Commerce, specifically, Kim Bova, for organizing an information-packed, and fun event and for photographer Deborah O'Brien who captured the morning in photos. Compassion was on the minds of the hundred plus community members as they departed Silver Spring Country Club Friday morning. Marconi summed the vibe of the community event perfectly when he said, "Watch what the Prospector Theater does because success can be the result of compassion."